Sewer Cover Throw Rugs | OhGizmo! While not a gizmo or gadget per se we here at OhGizmo still appreciate a unique bit of design when we see it. And these throw rugs modelled after manhole covers from large metropolitan cities definitely fall under unique design. 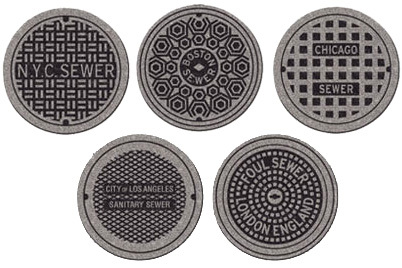 Currently available are manhole covers from New York, Boston, Chicago, Los Angeles and even London. They’re made from 100% recycled truck tires and are nylon flocked making them extremely durable and suitable for indoor or outdoor use. At 24 inches in diameter they certainly won’t go unnoticed either. If you’ve moved onto suburb life from the big city a few of these around the house might help ease the transition. The Sewer Cover Throw Rugs are available from Perpetual Kid for $23.99 each.